Product prices and availability are accurate as of 2019-03-30 22:21:10 UTC and are subject to change. Any price and availability information displayed on http://www.amazon.com/ at the time of purchase will apply to the purchase of this product. The 12" casaWare Pizza Pan is designed for baking delicious pizza, whether homemade or store bought! This pan has two nonstick ceramic coatings that make it durable and easy to clean. The cream colored nonstick ceramic surface is PTFE Free, Cadmium Free, Lead Free, PFOA Free and PFOS Free. 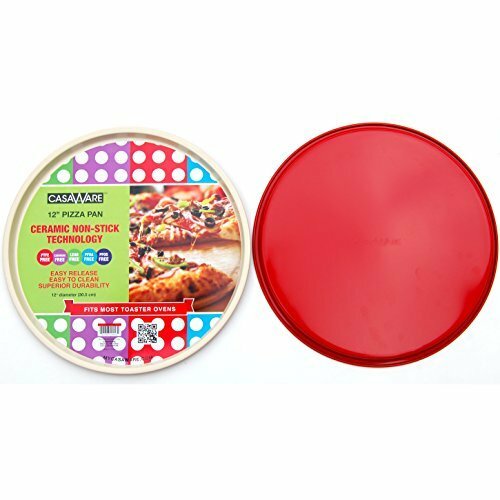 The base of the Pizza Pan is fashion colored, high heat resistant nonstick. USE and CARE Instructions: Before First Use- Remove all packaging materials and labels. Wash in warm soapy water. Rinse and dry thoroughly with a soft cloth. UTENSILS - Plastic, rubber, silicone or wooden utensils are recommended. Avoid using any sharp objects or metal utensils because they can scratch any non-stick surface. Always remove food from the pan before slicing or cutting. CLEANING - Cool completely before washing. Hand wash with a soft cloth or sponge and nonabrasive cleansers or liquid dishwashing soap in warm water. Rinse and then dry with a soft towel. Ceramic Non-Stick Technology Provide a Greater Baking Experience. Very Easy to Clean. Just wipe or scrub softly and the food slides off easily. Ceramic Coating is FDA, California Proposition 65 and European Union Approved. The Ceramic Coating is Cadmium, Lead, PFOA, PTFE and PFOS Free. Fashion Colored bakeware with colored exteriors and cream colored ceramic coating interiors. 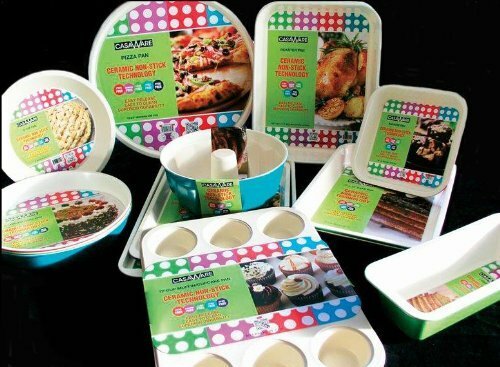 Part of casaWare's collection of best-selling bakeware items. Each sold separately. Double Coated Ceramic Surface over 0.5 mm carbon steel provides Long Lasting Durability and Scratch Resistance. Heat Tolerance to 536F, no peel off or blistering in high temperatures. Product dimensions: 12-Inch diameter. This pan also fits most toaster ovens. Hand Washing recommended, do not immerse in water. Do not microwave. Refer to product description for Use & Care Instructions.